The strongest of all the decepticon warriors. cool. does he turn into a M1 Abrams tank, or does he turn into a diffrent kind of tank? or a cybertronian tank? this looks like a cross between a tank and G1 meg! yea i guess your right!! This really looks good man great job! Woah.. Cool. 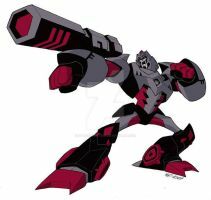 I prefer megatron as a tank or vehicle. Sometimes it's hard to get past mass displacement. As always... nice job on the colors. thanks! yea i wish he was a tank in the movies...but alien fighter is just as good.